Since training in the martial arts cultivates self-reliance, it is the self that we should come to refer to as a reliable guide. 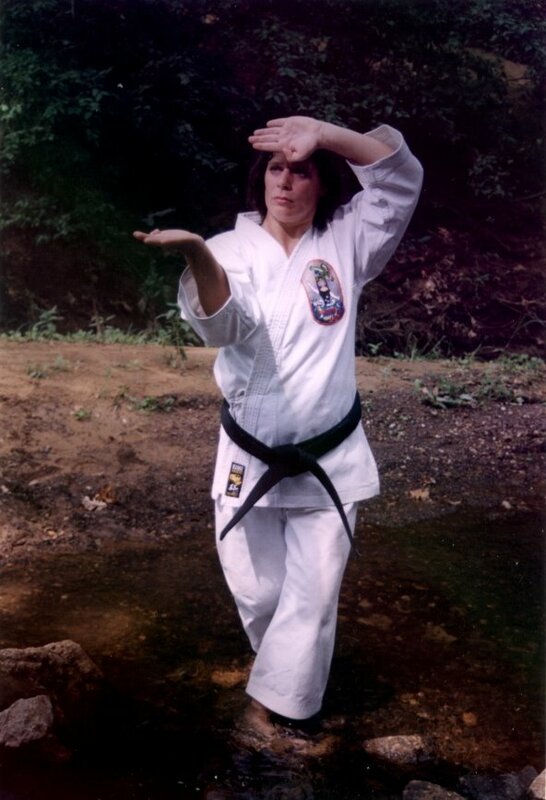 Trophies, pats on the back, and colored belts are not necessarily reliable indicators of proficiency. In fact, they can and often become stumbling blocks. Occasionally, practitioners become attached to the idea of doing something well, but if someone else has other ideas (as in the form of a derisive remark), it can be a long and painful fall to the mat. Our desire for approval is directly proportionate to our repulsion to criticism; they are fundamentally born of the same seed of fear. The idea is to develop the capacity for self-reflection. This dissipates the need to rely on others for a sense of identity or value, otherwise this shaky sense of self follows us right into the dojo. To further compound the problem, there exists a rigid, almost militaristic hierarchy in virtually all martial arts schools that dictates and reinforce our so-called worth. Line Up! Black belts assemble in the front line, lower ranks in subsequent lines to the back of the deck. Whenever I visit a school, I'll line up next to a white belt, just to see if anyone notices. Humility is a lesson that is best taught without preaching. A common term used to characterize the classical warrior was mizu no kokoro - mind like water. This is popularly defined as a reposed state of mind, akin to a calm lake. But there's more to it than just that. A body of water reflects back whatever comes its way, whether it's a bird flying overhead, or the vastness of the moon. It doesn't absorb, judge, or inflate itself with the image presented before it. The water doesn't ripple or move, it just is. Be that way. Be like the calm lake. Then whatever comes your way, whatever anyone says about you, you'll be able to take it graciously without it affecting who you really are. "Humility is a lesson best taught without preaching"
so true- there is no other way, really. Humility comes from within and there is no way to really "teach" it without living it and setting a good example. Unfortunately, some students need to be knocked down a couple notches to be humbled. And they usually are at some point. John, as I was studying about self-image, I learnt that it was relationship based. We actually developed a sense of our value based on how we interacted with people. One of the main needs in the human psyche is to "belong" to the group, or as the poet said "no man is an island". As I read your words, I realize that we can take control over this inner innate need, and build a strong self-image on our own security that we always "belong" where we desire to be regardless of other's opinions or behaviour towards us. It really doesn't depend on them, but on our own perceptions, and expectations. Welcome to my site. Yes, the important lessons have to be experienced for them to sink in. Thanks for your input. Right, it's both; we need both interaction and self-referral. It's a razor's edge to maintain that balance. Dogen also said, "When we discover that the truth is already in us, we are all at once our original selves." Can we really trust human nature that far? Humility is important and I agree with frotoe on that. I'm not sure I'm following you, Mat. My article was about holding up under negative judgements and opinions of others through self-referral. Absolutely! Knowing and doing are not the same thing. I find that it's easy for me to have the calm approach in the dojo. Outside is where I'm not as good with that. I am getting better, but it is a difficult lesson to learn. ditto blackbeltmama. i guess it's a matter of discipline. When I trained in aikido, many years ago, I noticed that the dojo was a haven for what I called "dojo nerds." They preached harmony, harmony, harmony; inside the dojo, but outside their lives and relationships were in shambles. Budo is supposed to enhance your life, not replace it. Thanks for reminding me that Rick! I know, I was a bit vague. but what you're talking about : "The water doesn't ripple or move, it just is. Be that way. Be like the calm lake. Then whatever comes your way, whatever anyone says about you, you'll be able to take it graciously without it affecting who you really are." implies something else. That you're good to begin with. And that often is not the case. I've just seen too much of the bad side of the human being to say otherwise. Hence, my first comment. Makes sense? You make a good point. It's difficult to relax or be at home in unfamiliar surroundings. It takes time. A bit vague? You're telling me! I always like the direct approach. Okay, enough clowning. Few of us are "good" to begin with. Very few. Being resolute and strong are qualities everyone wants. Maybe I make it sound that being calm in the midst of a storm is easy. Of course, it all takes time. I agree a bit with Rick. These "dojo nerds" have their equivalents outside the dojo as well. Often, they are folks who talk constantly about how they have found "peace" and "harmony." I find that interesting, because the people I have met who truly exhibit what John is talking about--this sense of self--feel no need to advertise to others that they have found this truth. John, as always an insightful post. I wonder if this sense of self is part of what makes the sensei/student relationship so unique? One's sensei is one of the few people who teaches you to cultivate this sense of self; as a result, their comments, criticisms or opinions can have an intense impact. Perhaps this is why many senseis say very little--because their words carry such weight. If at least one reason you train in martial arts is to improve your technical performance then, I think, compliments (as well as criticism) have a role. Compliments on your performance are a means of measuring improvement. While somethings (e.g. how forcefully or high you kick) are things you can benchmark for yourself and against which you assess your own levels progress, others (e.g. how well you perform a kata) are very difficult to self-assess once you get past the obvious. If you only ever receive criticisms, you may begin to wonder if you are improving; if you doubt you are improving over a long period of time, then I think your commitment becomes eroded. It's the sincerity of the critique (negative or positive) that matters here. An honest, genuine opinion should always be welcome. Quite often, somebody will say something that really has an ulterior motive, not because they have something constructive to offer.